Relaxed and approachable, Speakeasy impresses with a delicious menu that spans a wide range of world-inspired dishes. The moody colour scheme and lighting accented by a chic design creates a relaxed ambience that is perfect for socialising. A nod to the speakeasy America’s prohibition era culture of illegal drinking dens, Speakeasy celebrates the art of imbibing in good vibes and good food with a good drink in hand. In line with Speakeasy’s social setting, the menu items are designed primarily for sharing. To start, we loved the prawn skewers - Full of flavour and perfectly cooked, this is the perfect summer dish. For mains we fell in love with the Gisborne duck breast. The slices of duck breast were cooked to a rarely found perfection, allowing the rich flavour of the duck to shine through. 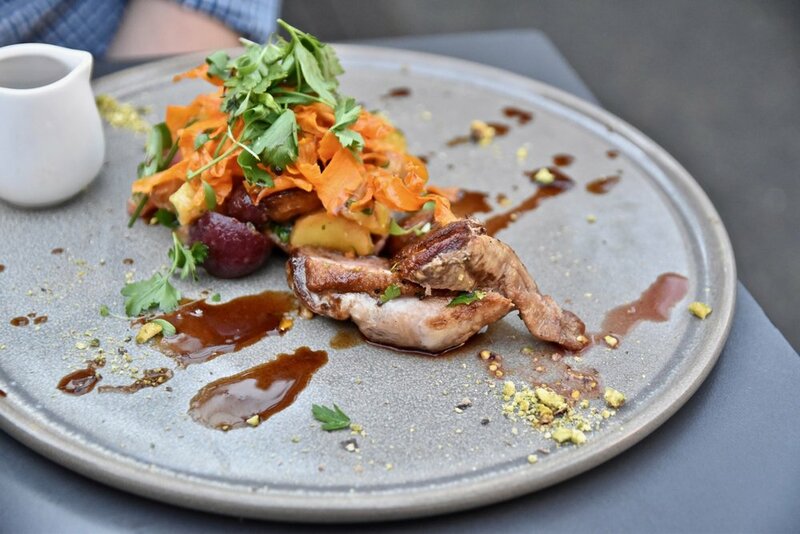 The accompanying honey glazed persimmon, fried spuds, baby mushrooms, radish and pistachio were delicious with together with the sour plum sauce which provided the crowning element to a luxurious dish. The dish of Crispy ocean trout was similarly delicious. The trout boasted a moreish crispy skin and was beautifully melt in your mouth. The oily texture of the fish provided a stunning contrast to the fresh chilli citrus tabbouleh and apricot and lychee dressing. The addition of goat cheese curd added an extra touch of luxury while the lotus roots crisps added texture. To conclude your evening on a sweet note, the Speakeasy serves a range of delightful desserts. Think Coconut and Passion Fruit Cheesecake as well as an Espresso and White Choc Panna Cotta with saffron poached pears, chestnut mascarpone, hazelnut praline and meringue shard. Both amazing! Located in the heart of South Yarra, Speakeasy certainly entices with a menu of dishes that are bold and diverse, alongside an excellent cocktail list.